Riverhead, Town of Riverhead, Suffolk Co. / Southold, Town of Southold, Suffolk Co. / Mattituck, Town of Southold, Suffolk Co. / Greenport, Town of Southold, Suffolk Co.
A scarce example of Fredrick W. Beers' map of the town of Riverhead, Long Island, New York. Published in 1873, maps are printed back to back. Covers from Southampton and the Peconic River northward as far as the Fair Grounds and St John's Church. Verso offers town plans of Southold, Mattituck and Greenport, with an inset of Fanning's Point. Detailed to the level of individual buildings and properties with land owners noted. 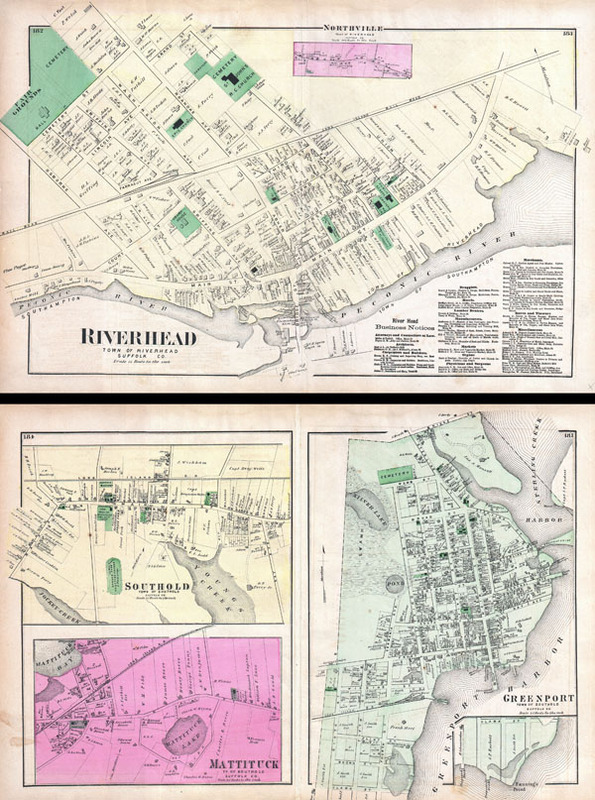 This is probably the finest atlas map of the town of Riverhead, Long Island, to appear in the 19th century. Prepared by Beers, Comstock & Cline out of their office at 36 Vesey Street, New York City, for inclusion in the first published atlas of Long Island, the 1873 issue of Atlas of Long Island, New York. Very good condition. Original centerfold. Map runs off paper, as issued. Town plans of Southold, Mattituck and Greenport on verso. New York Public Library, Map Division, 1527352, 1527351, 1527353.